To conduct a scientific evaluation of 2D images, GSA Image Analys-er turns out be the correct tool. It is able to recognize and count the objects in a picture. Import: The GSA Image Analyser program is able to read most popular graphics formats. To do this, the user must select an image and import it into this software before starting any treatment. Identification: To consider a form, this program performs in several different ways. It can make a systematic enumeration of objects, even those that overlap. Can also be a manual count, according to the preferences of the user. Calculation: The estimation of the surface of the identified objects is auto-matically determined by GSA Image Analyser. It can also calculate relations between surface of the entire image, or the background only. Calibration: To have correct information, to do a calibration of measuring tools.This function allows to know the resolution of shadow for the files did not contain the necessary information, as well as perform the biometric op-erations. 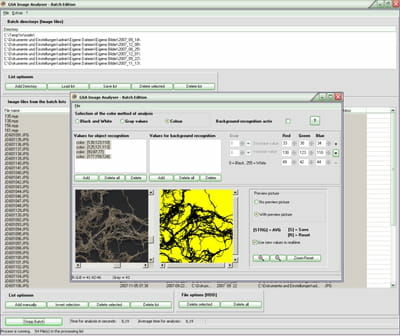 GSA Image Analyser offers different filters. It supports the formats of images taken on digital and video cameras. GSA Image Analyser software here is a shareware version. Latest update on June 5, 2015 at 01:22 AM.